1.) Because my mother is always three steps away from swooping in and rescuing the baby from my neglectful folly in trying to feed them a strawberry yo-yo for lunch. 2.) Because the words “shhh, we’re in John Lewis. People come here for a bit of civilisation and class,” mean nothing to a 14 month old. 3.) Because in particularly bijou establishments, the door has to be open for there to be any air at all, and closing it to prevent escape by a marauding toddler leads only to suffocation of the other patrons. 4.) Because Greek salad is apparently not an acceptable toddler dinner. 5.) Because the pushchair is blocking the exits and now we’re all trapped. 6.) Because a Cafe Nero cardboard cup holder is a very attractive snack to a baby. 7.) Because I was so busy supervising a child that I accidentally bought a chicken salad despite being vegetarian. 8.) Because five months is too young for a babychino. Even if it is free. 9.) Because high chairs stacked on top of each other are a serious health hazard for a single parent balancing a baby in one hand and a coffee in the other. 10.) Because newborns are not supposed to leave the house, apparently. 11.) Because spending ten minutes fiddling under a breastfeeding cover in Cafe Nero trying to get a newborn to latch is not conducive to the release of oxytocin and a comfortable and relaxing breastfeeding experience for either mother or baby. 13.) Because that guide dog is taking a well-deserved break and probably doesn’t want to be poked repeatedly by a small child. 14.) Nor does that adult. 15.) Because, having kindly provided toys for their younger guests, the cafe probably doesn’t want them being lobbed across the room at unsuspecting fellow patrons. 16.) Especially not when it’s Enid Blyton’s Book of Bible Stories. Enid would be having none of that, and neither, I suspect, would God. 17.) Because letting a toddler play with a metal spoon is a great idea. Until they start using it to destroy the furniture in the loudest way imaginable. 18.) Because there is only a finite amount of excitement that can be generated by a Pret A Manger straw. 19.) Because hot drinks and small children don’t mix. 20.) Because the torrential downpour outside is far more interesting, according to Piglet, and I WILL run out into it. And one reason why we should….. 21.) Piglet once dislodged a cushion in Starbucks, allowing Mummy to miraculously discover an abandoned sum of £40 stuffed down the side of a sofa. We should always go to cafes. That will happen again, right? £40 wow. I love babies. All disruption excused for £40 I say. Exactly! I found myself sneakily checking the area for cameras though, in case it was some sort of Beadle’s About-type situation. No, but you are right-I definitely should! Haha- this is hilarious and so true. Mine is lightning quick at grabbing forbidden items too. But I do love cake and normally that’s what brought me there. My cake love might be greater than my low stress environment requirements. Ditto. Coffee and cake. They lure me in with their siren’s call, even though I know I will regret it. I seem to have this expectation that Piglet will fall dutifully asleep whenever we approach a cafe, when in fact the opposite is true. Mine have been pretty much brought up in cafes if the last 11 years of photos are anything to go by! #5 and #7. PML as the quaint English expression goes. I shall leave you with this: fast forward a bit when they’re both in school and you can Go. To. A. Cafe. Alone. I bet I’ll miss it when I can go to cafes on my own. Once, when Piglet was at a settling in session with the childminder, I went and sat in a cafe on my own, only to feel bereft that there were a bunch of mums with babies on my left and I couldn’t join in with them! YES, what it is it with menus? Thank you for commenting. Goodness number 14! 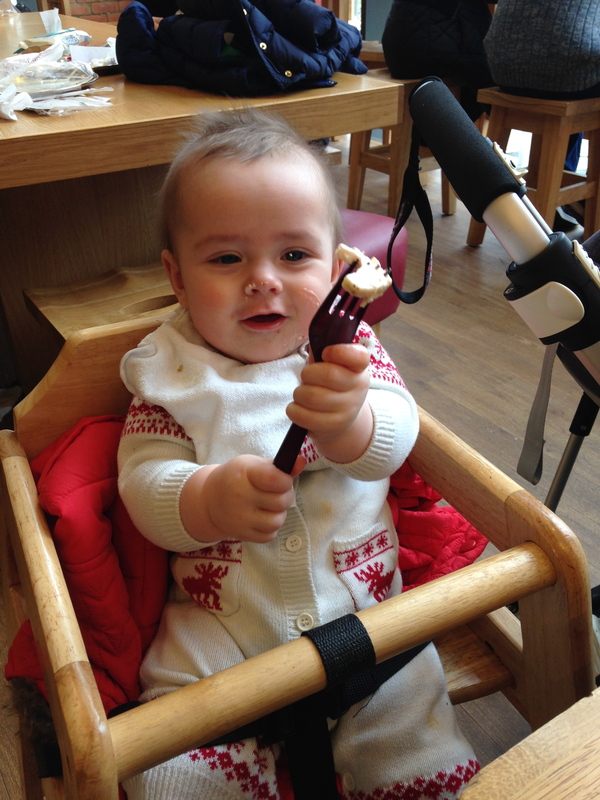 My little one decides he’s a drummer as soon as he can get hold of a spoon. I have conducted a mammoth survey of the cafes in my area to find the ones with accessible toilets, buggy space, highchairs not covered in grime, enough noise to mask baby cries and last but certainly not least good coffee. I didn’t find one but I had fun trying. So many times I have given Piglet a spoon to hold on the assumption that it will keep him quiet, only for him to bash the tables with it so hard I fear he’s going to crack the table! They don’t. They’re like baby dormitories, right? Where they’re supposed to fall asleep while the mums grab a coffee in peace? Haha nice! Clever Piglet!! Why does Dexter not do that? Sadly it seems to have been a one-off, but I live in hope. Thanks for commenting. I totally understand! Especially how the pram blocks the exit! So annoying isn’t it. I have actually been to an establishment that markets itself as a “baby cafe.” Despite the fact that it did have a ball pool, I would still be inclined to argue that the juxtaposition of “baby’ and “cafe” was a mix that should never have been attempted. Think infants crawling under tables, buggies clogging up every aisle, and rogue balls from the ball pool roaming the surrounding streets like some sort of dystopian post-apocalyptic world in which humans have been replaced by small plastic balls, and you would have roughly the right idea. I actually went to the cafe on my own today, and marvelled at how quiet it was without Piglet bashing the table with a metal spoon and flinging toys around. Bliss! Ha ha! You had me at “neglectful folly in trying to feed them a strawberry yo-yo”. Great post! And so, so true! Haha, sounds like I have a lot to look forward to! Ah yes, we should never go to cafes either. But mumma needs COFFEE!!! Ditto! I think I’m going to need an intervention for my addiction. Haha!! Great post! I gave up on taking mine to coffee shops for a while, for ALL of those reasons! But now they’re older and a bit more bribable, I’ve just started venturing to them again! I find that ‘if you sit there quietly/don’t set the place on fire/show me up to look like I’ve given birth to two wild animals, yes you can have that hyper inducing chocolate cake that organic sugar haters will judge me for’ usually buys me just enough time for a small peaceful coffee! I have a feeling that’s going to be me soon (with the chocolate cake). At the moment Piglet is happy to munch on a banana so I’m milking this stage for all it’s worth! I can totally sympathise with this post, having spent an awful lot of time (and money) with my littlies over the past few years, imbibing enough caffiene to kill an elephant. Pro tip: drinking two large filter coffees from Starbucks one after the other is a very, very bad idea. Oh, and that little onsie? Adorable! Thanks! No, so far I haven’t had the pleasure of coffee and pineapple juice. I’m sure it is just one of the many joys to come! I laughed out loud at number 5!